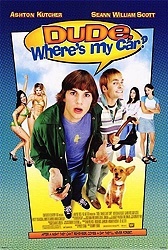 Patrick and Doug can't find their car. Shibby. I literally just popped this in last week, my girlfriend and I were in a comedy mood and she had never seen it. I was a little disappointed that I ended up laughing more than her, maybe it's more of a 'guy' movie or maybe it was more of a nostalgic session of sorts for me since I remembered most of the jokes and lines from my teenage years. Sad to hear you guys are higher on Harold and Kumar (no pun intended, but I refuse to rewrite that sentence.) That's my prime example of dumb movies that just work so well. This is great tho, watched it for the first time in 15 years last night and it's just as strange and funny as I remember.